After two experimental albums merging classical music with rock, The Electric Light Orchestra, by now, were trying to to build a bit more of a polished, commercial, pop identity. Only to an extent, though, as this, their third album, still contains a considerable amount of decidedly uncommercial material. Despite the excellent hit singles of "Roll Over Beethoven" and "Showdown" the band were struggling somewhat to form their own identity on their patchy albums. 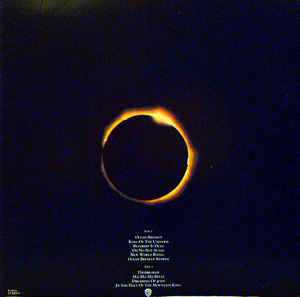 (Neither singles were included on the UK albums). It would not be until the next one (or even the one after that) that any real change in direction would be felt. Admittedly, this offering was far more streamlined than the madcap, Roy Wood-inspired adventures of their debut album, but this was still a bit "off the wall", and so Beatles-influenced as to be too close for comfort. A lot of it has little or no commercial appeal. The opener, "Ocean Breakup/King Of The Universe" contains quite a few trademark Jeff Lynne characteristics, in both its instrumentation and vocal delivery, it is still quite indulgent in its Beatles-esque inventive tempo swings. The next track, "Bluebird Is Dead" is even more Beatles-influenced. 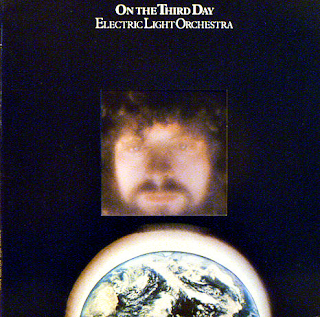 It is still a most derivative track and although it is ok, it falls short of being something that one could say was unique to The Electric Light Orchestra. It has a great bass/drum interplay bit at the end though, before segueing into the frantic, Eastern influence meets The Beatles of "Oh No Not Susan". This was even more Beatles-inspired than the others and indeed, it runs straight into "New World Rising/Ocean Breakup Reprise". Both of these tracks are full of Lennon-isms and McCartney-isms too, merged with Jeff Lynne's wild, unfettered classical instrumental stylings. It is all quite bizarre at times, but it does, like the other albums, have an odd appeal. The material certainly merits a few listens to try and fully appreciate it. This whole "side one" was like some sort of crazed Beatles/psychedelic pastiche. Nevertheless, for all its derivativeness it is actually quite enjoyable. "Daybreaker" begins the old "side two" with a very prog-rock style instrumental, full of swirling synthesiser and sweeping strings over a fast rock drum beat. In many ways, this was the sort of classical/rock sound Jeff Lynne was looking to build on now. It was shorter and more punchy than the original sprawling offerings from the Roy Wood era. Up next is possibly ELO's most authentic, heaviest, pure rock in "Ma-Ma-Ma Belle" which was deservedly a hit single and had one hell of a chunky rock riff and a huge drum sound from the mighty Bev Bevan. The cello and the lead guitar merge superbly, the cello playing riffs too. Great stuff. "Dreaming Of 4000" has an infectious soulful bass line and some excellent electric guitar but it is still musically bonkers in its tempo shifts and inability to know exactly what it is. When the chorus bit bursts into life, though, it rocks. "In The Hall Of The Mountain King" uses Edvard Grieg's music for a muscular piece of classical/rock in the typical early seventies ELO style, sticking close to their original concept of merging classical and rock music together. It works too, it is powerful with some seriously thumping drums. I always felt with these early ELO albums, however undeniably brave and ground-breaking they were, they didn't quite feel fulfilled and always seem a bit patchy. Having said that they all require, and get, several listens on the occasions I dig them out.